Following the final battle of the New Gods, the spirit of the lord of evil, Darkseid, tumbles through time itself, coming to rest on Earth, where it, along with the spirits of the other evil gods of Apokolips, manifests itself in the body of a human being. Darkseid’s “fall” has sundered reality, creating a singularity at the heart of creation, into which all of space and time are slowly being drawn, setting the stage for the evil god’s final victory, to be claimed in his inevitable death. Through his agent Libra, he arranges for a huge army of super villains to be gathered, who capture and murder the Martian Manhunter as the opening salvo of the conflict. Coinciding with the Manhunter’s death is the arrival on Earth of Nix Uotan, an exiled member of the cosmic Monitors, who has been sentenced to become human as punishment for failure in his duties. Following the trail of a group of missing child prodigies, detective Dan Turpin discovers the dying body of Darkseid’s son, Orion. 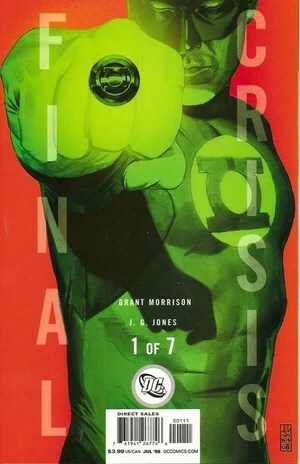 The Justice League of America liaise with the Green Lantern Corps to investigate the murder, deducing the cause of death to be a bullet of Radion—a substance toxic to New Gods—fired backwards through time from the future. New God Granny Goodness, possessing the body of Green Lantern Kraken, stymies the investigation by framing Hal Jordan for the murder; when Batman deduces her true identity, she captures him and teleports him to Command D, a government bio-chemical weapons facility beneath the city of Blüdhaven that has also fallen under the control of Darkseid’s minions. Slowly becoming aware of the threat the evil gods pose, Alan Scott enacts “Article X”, a super hero draft, that readies Earth’s metahuman forces for the coming war. With Batman and Jordan removed from play, the New Gods continue to eliminate the greatest threats to Darkseid’s plan. Wonder Woman is infected by the Morticoccous bacteria by a Desaad-possessed Mary Marvel while investigating Blüdhaven. Superman departs for the future in order to obtain a cure for Lois Lane when a bomb in the Daily Planet building mortally wounds her. 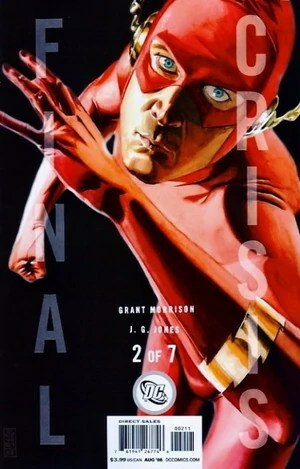 The original Flash, Barry Allen, is resurrected from within the Speed Force by powers unknown, but then races back in time alongside Wally West, attempting to outrun the Black Racer, the Death of the New Gods, and stop the bullet that will kill Orion. Turpin’s search for the missing children leads him to the Dark Side Club, where he is confronted by Darkseid’s human host, Boss Dark Side. 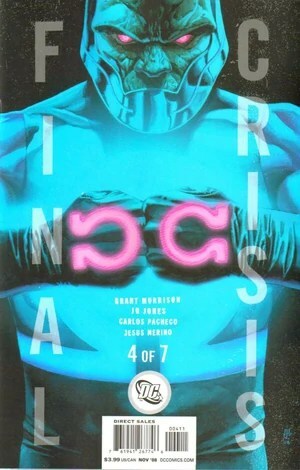 The evil god transfers his essence into Turpin’s body and brings him to Command D, where the detective is subjected to bio-genetic restructuring to transform his body into a replica of Darkseid’s original form. Concurrently, Darkseid’s agents release the Anti-Life Equation through all of Earth’s communications networks, spreading it across the entire planet. The two Flashes, having failed to prevent Orion’s death, emerge from the time stream one month after the equation’s release, and discover that the minds of nearly the entire population have fallen under Darkseid’s control, with its super-human victims having been transformed into a military force of “Justifiers”. With the help of the Tattooed Man, the Super Young Team and former allies of the New Gods of New Genesis Shilo Norman and Sonny Sumo, the small cells of super heroes who have managed to resist the equation discover a possible salvation: a symbol from the alphabet of the New Gods that will break the equation’s control over minds, which was gifted to the cave-boy Anthro by Metron in prehistoric times. 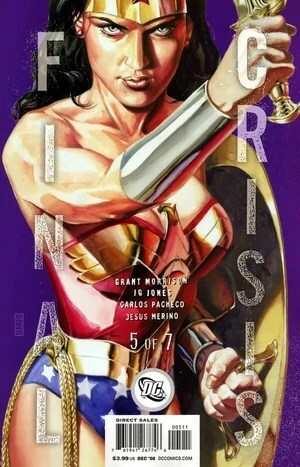 Meanwhile, a huge battle erupts between the superheroes and the Justifiers in Blüdhaven, during which the equation-controlled Wonder Woman infects the heroes with Morticoccous, which strips the heroes of their powers. However, the loss of these troops is soon mitigated by the turning of Libra’s Justifiers, control over whom is usurped by Lex Luthor and Doctor Sivana so they can help defeat Darkseid. These twists and turns are observed by Nix Uotan, whose powers and memories of his true nature are unlocked with the help of Metron and a mysterious ape-like figure in a robe. Escaping confinement in Command D, Batman uses the radion bullet to mortally wound Darkseid, before the dark god uses his Omega Beams to apparently kill Batman. Superman returns to the present and tears Command D apart to recover Batman’s corpse, and faces off against Darkseid as the Flashes come racing into Blüdhaven, the Black Racer hot on their heels. As the heroes reach superluminal velocity, time warps around the Flashes, creating the temporal eddy into which Darkseid fires the bullet, sending it back in time to kill Orion. Outpacing Omega Beams fired from the eyes of the humans in Darkseid’s thrall, the Flashes lead both the beams and the Black Racer straight to Darkseid, finishing the job Batman had begun and bringing the touch of death to the god of evil. Simultaneously, The Ray traces the Metron symbol across the face of the Earth in beams of light, liberating all those under the equation’s control; the freed Wonder Woman uses her lasso of truth to release Darkseid’s consciousness from Turpin’s body. Although physically bested, Darkseid’s dying essence is still dragging all of reality into nothingness along with it. Time and space break down as the effect worsens, until eventually, only Superman is left in the darkness at the end of creation, struggling to complete a copy of the “Miracle Machine,” a wish-granting machine shown to him by Brainiac 5 during his trip to the future. 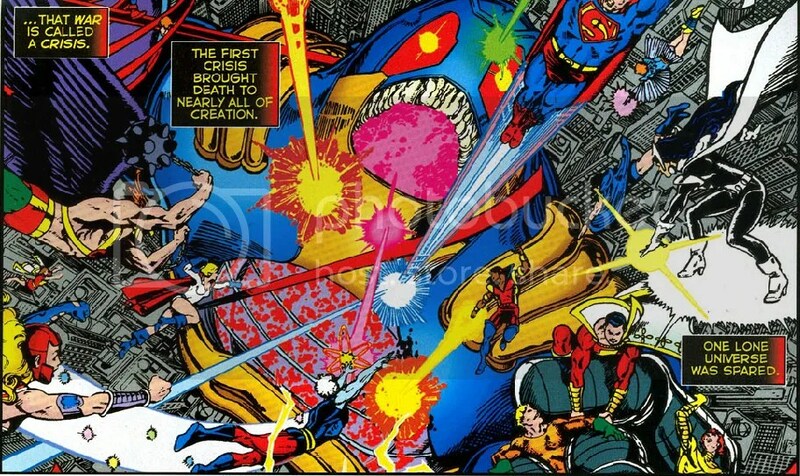 Darkseid’s essence re-emerges to claim the machine, but Superman destroys him for good by using the last of his super-powered breath to sing, countering the vibrational frequency of Darkseid’s lifeforce. With Darkseid’s end, however, the evil behind evils emerges: Mandrakk, the Dark Monitor, fallen father of Nix Uotan, who waits at the end of all things to consume what remains. Superman uses the solar energy in his own cells to power the Miracle Machine, and makes a wish that is granted by the appearance of an army of Supermen from all across the multiverse—including a particular Man of Steel who is based on U.S. President Barack Obama. Nix Uotan joins the clash, using his Monitor powers to summon the Green Lantern Corps, the Zoo Crew, the Super Young Team, the armies of Heaven itself, and more for a final battle with Mandrakk that culminates in the Corps spearing him with a stake made of pure light and created by the combined energy of their rings. The heroes drag Earth out of the black hole that is Darkseid, and Nix Uotan returns to being human as the other Monitors cease to exist in accordance with the wish Superman had made: a wish for a happy ending. In the distant past, Anthro dies of old age in a cave. 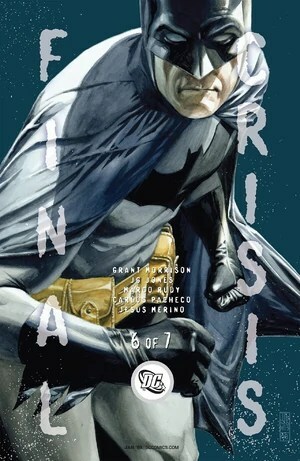 His body is discovered by Bruce Wayne—not dead, but sent back in time by the Omega Beams—who picks up where Anthro left off, drawing a bat symbol on the cave wall. Unfortunately, Captain Atom’s role in this crossover event is minimal. The Bronze Age Captain Atom is seen in one panel in DC Universe #0 (June 2008). 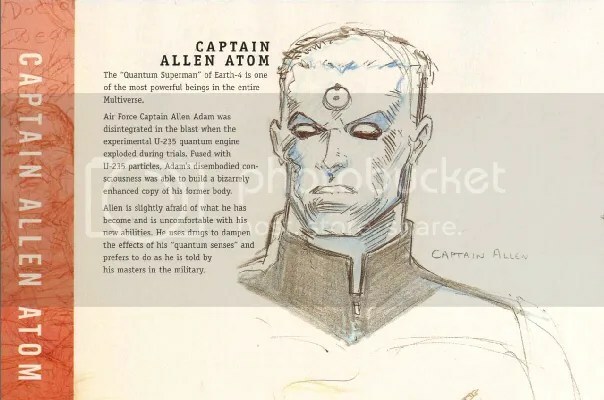 The Silver Age Captain Atom (or the Earth-4 Captain Atom – aka Quantum Superman) appears in the Final Crisis tie-ins Final Crisis: Superman Beyond #1-2. 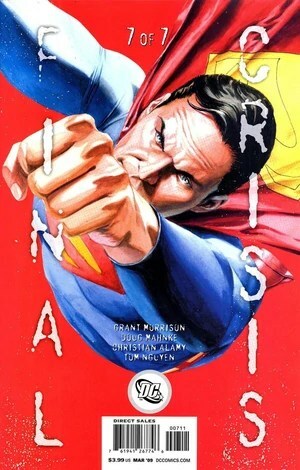 He is also in Final Crisis Secret Files.